Officially we hit summer this week (the 20th on my calendar). It’s exciting to leave one season behind and start a new one, but, on a vegetable farm, this transition gets pretty wild. The big challenge is that this section of time through June and a bit into July is when we have to simultaneously harvest and weed while squeezing in new plantings. Weeds just explode this time of year as you all probably well know. Think about battling weeds over four acres…crazy. At the same time we’re really excited to see summer crops get growing. I just saw blossoms on cucumber and zucchini plants a few days ago, so I know they are just around the corner. cherry tomatoes are blossoming too. I also get the feel that members also can’t wait for these summer crops to appear. Sure, a spring box full is greens is OK, but a summer box with some substantial heft is much appreciated. Spinach: Definitely not as pretty as I’d like after last week’s hail. Garlic Scapes: Green curled things…these are the tops of the hardneck garlic. Chop or mince and use where ever you’d use garlic. It’s a bit more mild than garlic cloves. Snap Peas: Yes, you eat the pod. Basic Directions: Preheat oven to 350. Chop veggie or mix of veggies of your choice and saute in frying pan over medium heat until crisp-tender or wilted. Beat 6 eggs together with Parmesan in bowl. Add veggies to mix and add to another ovenproof frying pan over medium-low heat. Drop temperature to low and let cook undistubed for 5-10 minutes until bottom is firm. Next, transfer frying pan to oven and bake until top is dry/not runny. 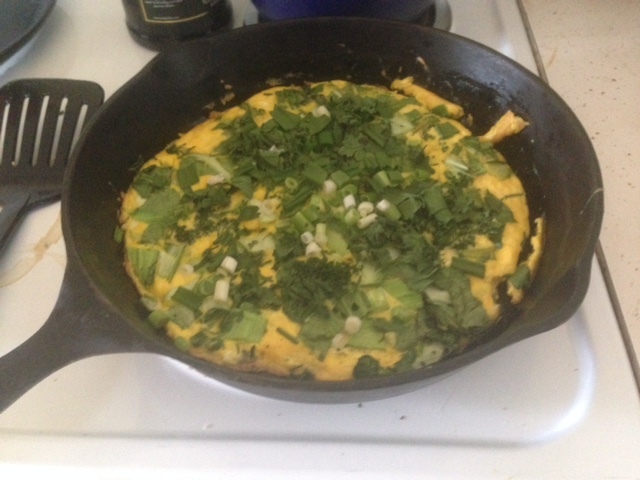 You can garnish with parsley or green onions. 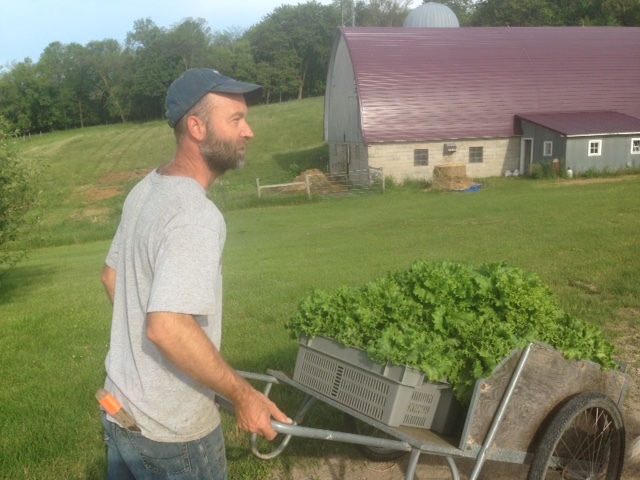 Another CSA season is starting, marking the beginning of our 11th season delivering produce to members’ doorsteps. The passage of time has compressed the interval between the end of the season and the beginning. When I was a younger man, it seemed like the nine months jn the “off season” between October and June took a long time. This past nine months since the last box in October, 2015 zoomed past me as quickly as Christmas break in high school. Instead of lamenting time under the bridge, however, I absolutely celebrate a new beginning and a new season. 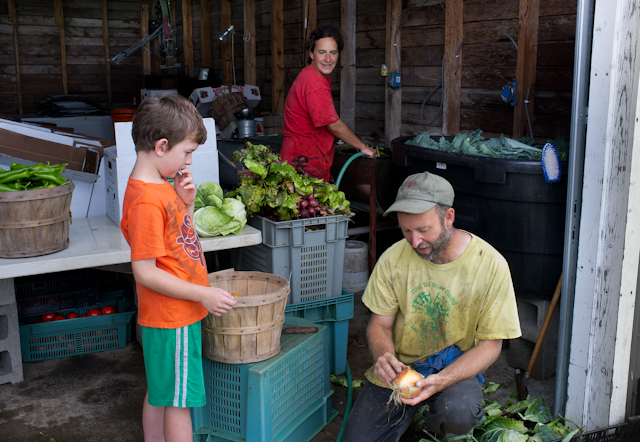 It often brings not just new growing experiences, but also a re-connection with CSA members and farmers market customers. The season so far is shaping up well. We have planted crops in good time and cultivated a number of crops 2-3 times already. We had a challenge with the soil being really dry through May which had us moving irrigation around (a first for us since I rarely irrigate and I’ve never had to do so in May). A lot of crops are looking pretty good; I’m especially excited about the peas and potatoes so far. I’m sitting in the kitchen writing this blog right now because of the morning’s rain. We were hit with a little hail even which I’m sure put a few holes in the Romaine lettuce. Broccoli: A variety called Packman, this came in earlier than we wanted due to the cold temps in May which caused the plants to set a head prematurely, which makes for small heads. Swiss Chard: This is great with eggs in the morning (saute and include them), but, hey, chard is even better with bacon! See recipe below. Mizuna: A mild Asian green. This can be eaten in a salad and used as a cooking green in such dishes as pho or many other Asian dishes. Spinach: Loose greens in the box. Coat a large saute pan lightly with olive oil and add the diced bacon, garlic, and crushed red pepper. Bring the pan to medium-high heat. When the garlic has turned a lovely golden brown, remove from the pan and discard. At this point the bacon should start to become brown and crispy. Add the Swiss chard stems and the stock and cook until the stock has mostly evaporated. Add the Swiss chard leaves and saute until they are wilted. Season with salt.